Let me begin my day with yet another session of 'everyday cooking'. Today I cooked Stuffed Bhindi which is my family's favourite sabzi. I don't cook it with onion/tomato curry and prefer it dry and without gravy. The rich flavoured stuffed bhindi gets a tangy twist with an addition of aam ke achar ka masala. It tastes heavenly in every bite and enhances the taste of every platter. 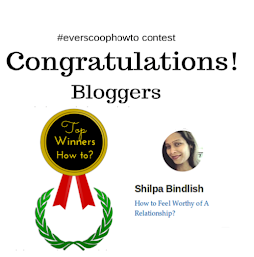 Wash and pat dry the bhindi. Cut the top and tail of each piece and make a slit length wise in each bhindi and keep aside. 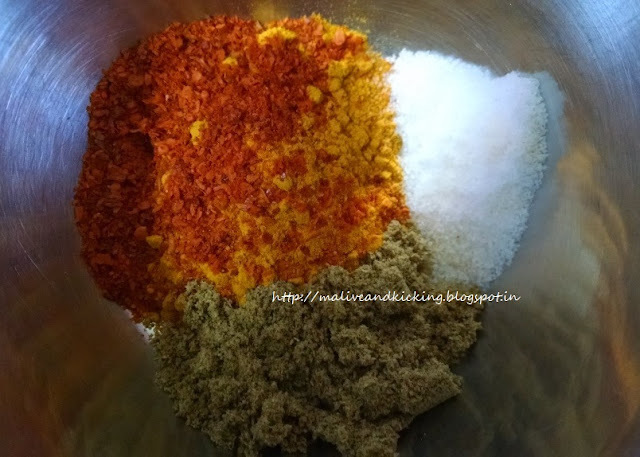 Mix the dry spices including red chilli powder, corriander powder, turmeric powder in a bowl. Add the pickle mixture to dry spices. 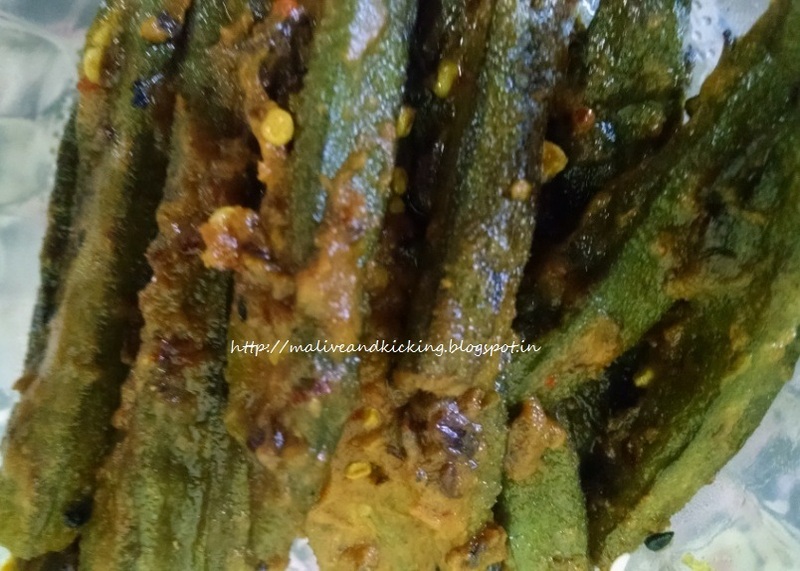 If there is no oil left in pickle mixture, do add half a tsp of mustard oil for proper binding of spices within bhindi. Stuff each bhindi with prepared stuffing. Heat 2 tbsp mustard oil in a wide bottomed frying pan over medium flame and carefully spread bhindi in the pan. Now reduce flame and cook bhindi covered on low flame. Stir occasionally in between 2-3 times until bhindi turns tender and dark green. 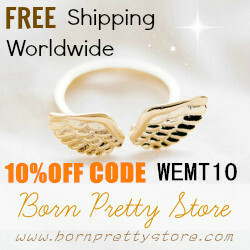 Turn off the flame and serve hot with roti, parantha or poori. 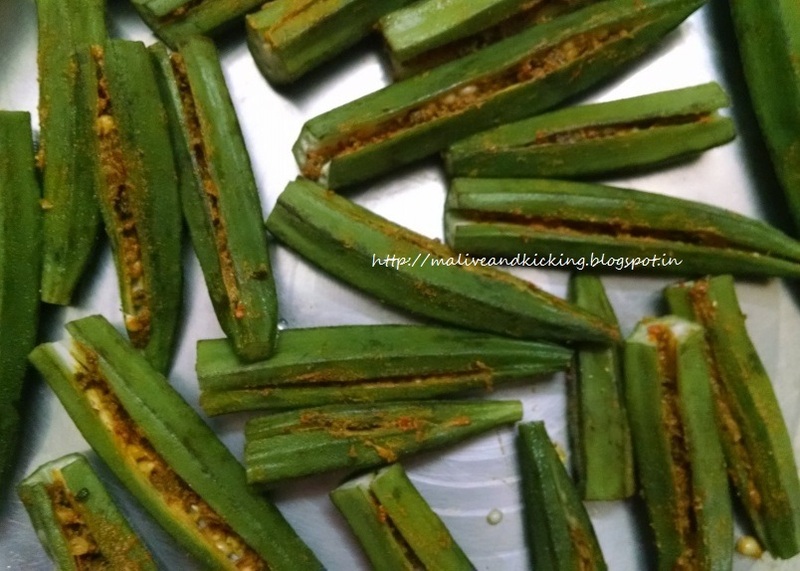 Never add water while cooking bhindi otherwise it will turn sticky. 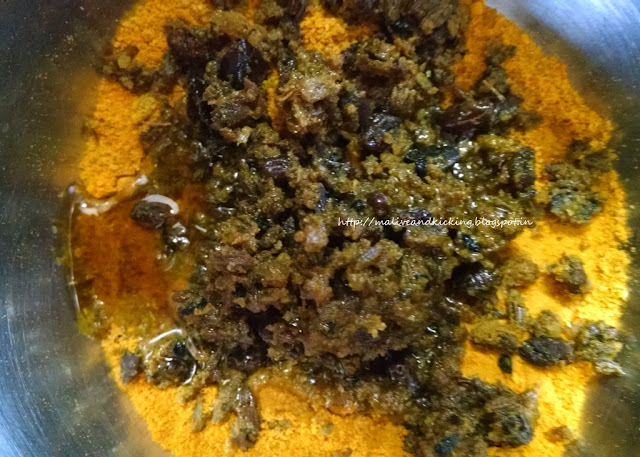 No need to add other spices in stuffing because they are already added in mango pickle mixture. Choose small and soft bhindi for faster cooking and better taste because mature bhindi with hard seeds becomes tough n stringy and does affect the taste. 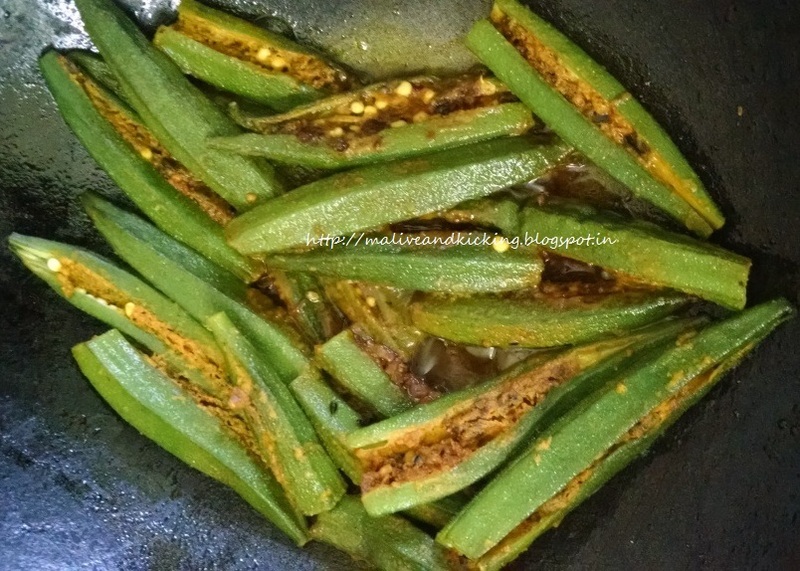 Try to spread bhindi in the pan in a single layer for even cooking. Do share your variations to the recipe, if you cook it too. 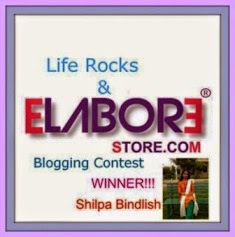 I would love to try..
Labels: Food & Drink, Recipe, Spicy, Stuffed Bhindi, Vegetable, Vegetarian. Definitely Jayanthi. I will keep sharing simple recipes that taste yummy and get cooked in less time. very yummy recipe!!! 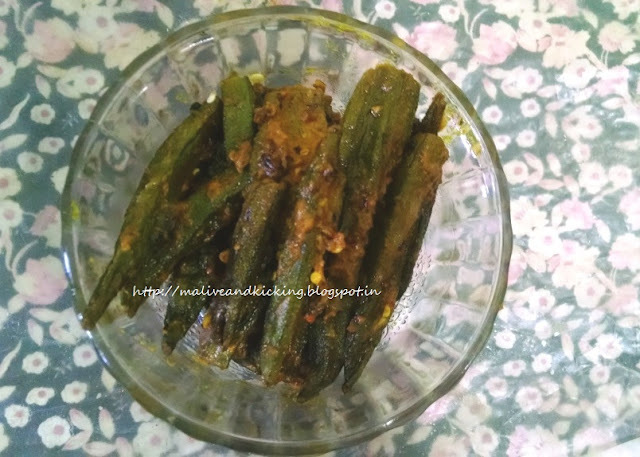 bhindi is my fav too, though we make Karela stuffed with mango pickle leftover masala but never tried bhindi, going to try now.